In the heart of the Emme River valley in Switzerland is the town of Emmental. It is here where master cheesemaker Bernhard Meier gathers milk from his grass-fed cattle and carefully produces daily just two wheels of handmade cheese following the original method that dates back to the 13th century. This cheese, called Emmentaler, is second to none; it is the epitome of what a traditional, generations-old, tried-and-true cheese from the valleys of Switzerland should be. 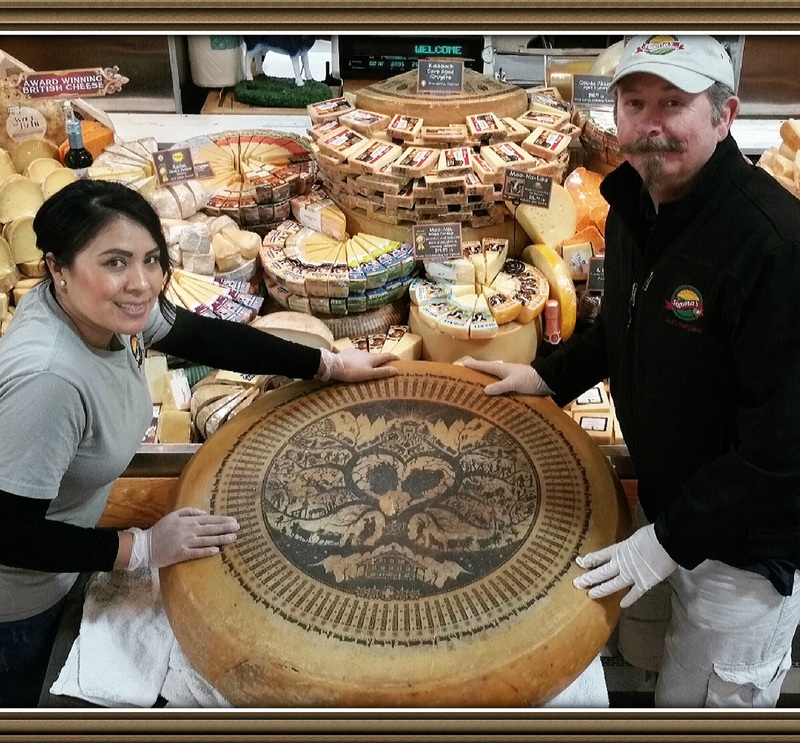 Sigona’s is proud to announce that our stores are two of only a handful of retailers in the Bay Area to carry this extraordinary cheese! PS – Mark your calendars! We’ll be cutting into one of the giant wheels at our Palo Alto store on December 8th (more info here). The Swiss make a lot of cheese, but only the Emmentaler is the original “Swiss cheese.” The heftiness of the wheels, the large holes in the cheese — sometimes the size of walnuts! — as well as the geographical area, or Appellation d’Origine Protégée (AOP), in which the cheese is made, are all features which have contributed to Emmentaler’s stellar worldwide reputation. The Emmentaler from the Gotthelf Emmentaler AOP is only produced by Bernhard Meier at his mountain dairy Hüpfenboden. He only produces two near 200-pound cheese wheels a day using his own unique cultures created in his dairy from the previous batch. This practice ensures the original character of the Emmental region; its unique grasses and herbs give the cheese its most authentic flavor profile. Meier’s Emmentaler is made using raw, unpasteurized milk and his own cultures, resulting in a cheese that is described as sweet with a nutty aroma, finishing with a hint of fresh-cut hay. This beloved cheese has a history, of course, riddled with competition, near extinction, star-crossed lovers and a battle of progression and industry. If it wasn’t for true love, the tradition and history of Emmentaler may have disappeared long ago. Depicted on the wheels of Emmentaler is the story of two young lovers as told by Swiss novelist Jeremias Gotthelf, the AOP namesake, in a book titled “The Cheese Factory in the Hamlet,” published in 1850. It was made into a movie in 1958. Long story short, “The Cheese Factory in the Hamlet” tells of two rivaling cheese producing areas. Felix, the son of one village mayor, met and fell in love with Annelie, the daughter of a farmer from a neighboring hamlet, on the way to the cheese market. The union of the two young lovers brought the areas together. Other economic development plans were halted and efforts between the two were concentrated into cheese production, resulting in one of the best cheese-producing areas in all of Switzerland. Up until the 19th century, Emmentaler was traditionally made in small village dairies in Emmental using only raw milk, and there are only a handful of small farms, like that of Bernhard Meier, still making traditional Emmentaler. Unfortunately, the original manufacturing method was not protected, so today there are very many copies of the cheese for sale. However, thankfully the traditional method is now protected under the “Emmentaler AOP” label, and Gourmino, one of the finest affinage (agers) and importers of cheese, has started a campaign called “Save the Emmentaler” to protect and promote the centuries-old tradition of cheesemaking. It’s stories like that of “Save the Emmentaler,” with its vivid history and limited product availability that we are passionate about telling, as we know you share our love of food, family, tradition and quality. We strive to bring you the absolute best, whether it’s a just-picked ollallieberry from Watsonville, a fresh-pressed olive oil or a cheese so rare it’s made by one family alone on an Alp peak or a river valley in Switzerland. 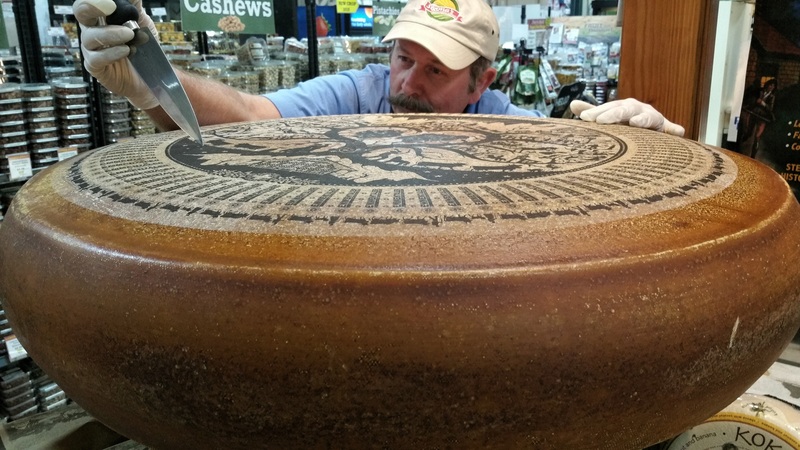 Come by from 2 to 4 p.m. Saturday, December 8th, to see us cut into our very own giant wheel of Emmentaler, and pick up a wedge or two to take home! We’ll have entertainment, games and an opportunity for you to win free cheese. You can’t beat that! #SavetheEmmentaler!